Katharine McPhee was the guest of the next show and treated to two songs that she sung live. 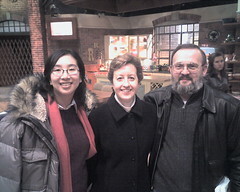 We weren't allow to take pictures during the taping, but the photo after the show. What songs did Kat sing? She sang "Over It" and another song I don't recall the title.